Let's say it's pouring again, just like it's done for three straight months now. You're facing another challenging road trip over pot holed roads in really bad weather. What's your ideal vehicle choice? That would be the Mazda MX-5 Signature. Does this compact SUV afford excellent all-wheel-drive traction in the wet? You bet. Does its cabin provide great visibility in all directions? Without doubt. Do the windshield and rear window both offer quick demisting and effective wipers? Yes indeed. Is the dashboard logically laid out with buttons for essential functions rather than attention diverting menus? Check. If bad weather throws you a curveball, the CX-5 has you covered. Not only that, but it's also a lot of fun to drive in the dry. In fact, this affordable ($36,890 base price) SUV will out-handle and out-pace much more expensive competition from Mercedes, BMW and Audi. If you can ignore the Teutonic myth of brand superiority, you'll find the MX-5 makes a most compelling case for purchase. Mazda offers five different variants of the CX-5. Three of them (Sport, Touring and Grand Touring) utilize a normally aspirated inline 4 with a very high compression ratio (13:1) to produce 187hp and 186lb.-ft. of torque. The two upper echelon versions, called Grand Touring Reserve and Signature are both equipped with a "Dynamic Pressure Turbo" that boosts output to 250hp on high test fuel and 227hp on 87 octane gas. In either case, the torque rating remains 310lb.-ft. at just 2000rpm. You'll definitely want to select the 2.5 liter turbo version of the CX-5, rather than the baseline 2.0 liter motor. Throttle response of our Signature was excellent, especially when augmented by judicious use of the 6-speed automatic gearbox. In Sport Mode, this transmission can be manually controlled to hold specific gear ratios. Unfortunately, no paddles are included to aid this cause. 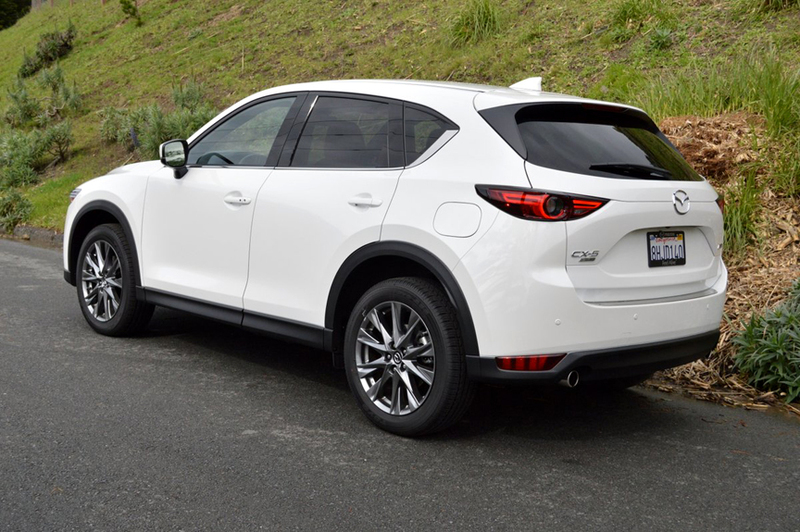 Given Mazda's punctilious attention to suspension tuning it comes as no surprise that the CX-5, equipped with 19 inch alloy rims and 225/55R19 Toyo A36 radials at each corner, will gobble up curvy pavement with authority both in the dry and the wet. Granted, even when the Drive Mode chosen is Normal, the CX-5 can deliver a somewhat pitchy and harsh ride that will prevent passengers from getting any reading done on rough surfaced roads. But the tradeoff in ride comfort is well worth the sacrifice in view of the dividend the CX-5 Signature pays in outright stability. We found it virtually impossible to disconnect those Toyo tires from the pavement thanks to the Signature's superb combination of shock valving, front and rear stabilizer bars, and fully independent front and rear suspension architecture. Although the CX-5's size and styling lead you to believe it's an SUV, its handling will lead you to quite another conclusion: the CX-5 is a sports car masquerading as an SUV. Recently, Mazda has made a concerted effort to upgrade the interior furnishings of the CX-5, and our sample's "Caturra Brown" Nappa Leather seating surfaces (for 5) will have you comfortably ensconced for the long haul. A couple of interior design aspects proved particularly endearing. The first design award goes to the Mazda engineer who decided the rear seats should flip down by operating just two simple release latches. The second example of ingenuity goes to the rear seat configuration which allows you to stow packages behind the front seat even when the rear seats are folded flat. About the only drawback we encountered in daily use was the head ducking routine necessary to climb into the front seat thanks to the CX-5's low roofline. Dropping the 8 way adjustable driver's seat to its lowest position eliminated that problem. Our test Mazda was so fully equipped that it hardly carried any extras on its window sticker. In fact the only options listed were a Cargo Mat for $70, Illuminated Doorsill Trim Plates for $400, Snowflake White Peal Paint for $200, a Rear Bumper Guard for $125, and a Retractable Cargo Cover (which cleared my bicycle without needing to be removed) for $250. So the option list on this Mazda, just like everything else about the vehicle, was extremely sensible. 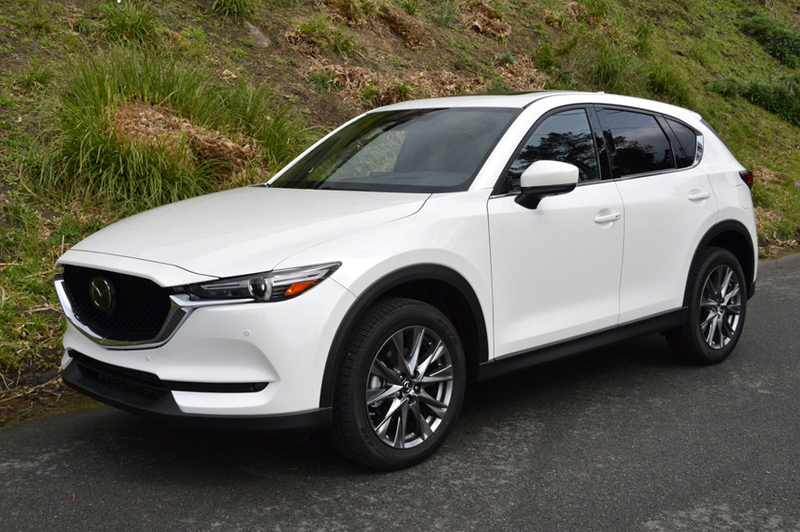 If you need to own an SUV for the storage and the multi- passenger convenience, but still want to have some fun driving it, the CX-5 Signature makes an optimal choice.